BEIRUT (AP) — A prominent rights group Wednesday called on Lebanese authorities to amend a nearly 100-year-old law that discriminates against Lebanese women married to foreigners, denying their children citizenship. Human Rights Watch’s deputy Middle East director Lama Fakih said the 1925 law has “caused untold hardship” for thousands of families, such as denying kids and spouses national health insurance, limiting access to jobs and requiring them to apply for residency every 12 to 36 months. A Lebanese father married to a foreigner can give his children his nationality, and so can a Lebanese mother with a child of unknown paternity, but not a Lebanese woman married to a foreigner. This also leaves many at risk of being stateless, the New York-based organization said. Continuous campaigning to amend the law has resulted in some steps allowing children and foreign spouses of Lebanese mothers access to work and public education. But the work permits for professions reserved for Lebanese citizens are discretionary and Lebanese children have priority in enrolling in schools. The government in 2013 accepted a proposal to grant some privileges to people born to Lebanese mothers but didn’t amend the law. HRW said since then the government has prioritized citizenship for those living outside the country over children and spouses of Lebanese women living in Lebanon. In 2015, the government passed a law granting citizenship to members of the Lebanese diaspora, again excluding the descendants of Lebanese women. “Recent steps to provide access to basic rights like education and work to the children and spouses of Lebanese women are steps in the right direction, but confusing and piecemeal measures are no substitute for equal citizenship,” Fakih said. Many children born to Lebanese mothers know no other home and some have even competed in international competitions representing Lebanon, yet they are still considered foreigners. 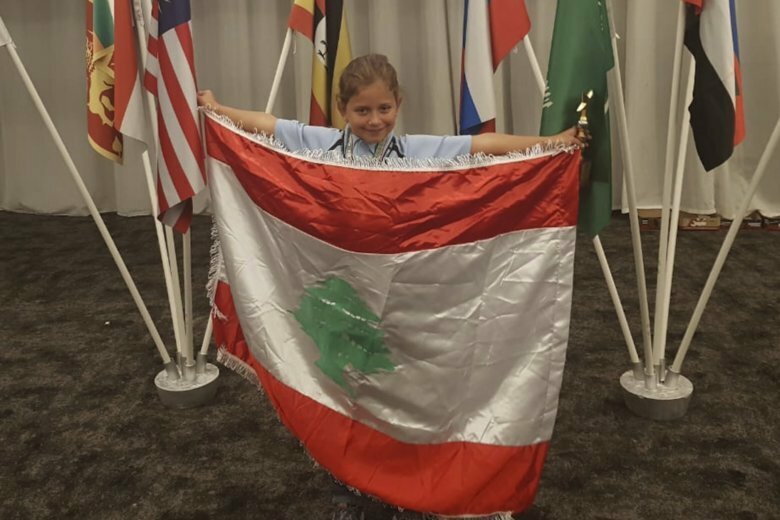 Rochana Atmeh, the Lebanese mother of an 8-year-old girl born to a Swedish father, said the family almost missed an Abacus competition in South Africa because the airline stopped them and asked for an English translation of the girl’s birth certificate. Issued in Lebanon in Arabic for her Swedish daughter, the document is the only proof Atmeh is her mother. After tears and searching, a translator came through at midnight to help with the documents and Atmeh and her daughter Jennifer Maria Hektor made it to Johannesburg, where Jennifer won first-runner up in her category. It is a typical experience but this time it almost cost the daughter her prize. “She’s born in Lebanon. She lives in Lebanon with a residency and every three years I have to apply for residency. Nothing on her passport says I am her mother,” Atmeh said. Hektor was photographed with the Lebanese flag in Johannesburg. The Lebanese team won more than 50 places of the 300 competitors and a row broke out at the airport welcoming the team back in Beirut. “When she was asked (as a winner) where she was from, she said she was Swedish but loves Lebanon,” Atmeh said. Other countries in the region, including Algeria, Egypt and Yemen, provide equal citizenship rights to the children of both men and women.